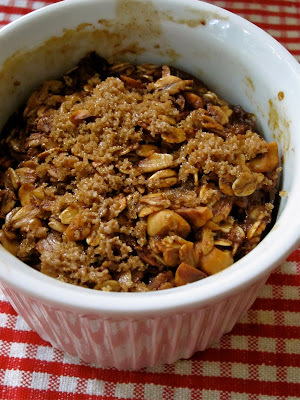 This beautiful bowl of baked oatmeal was meant to happen yesterday. But, yesterday morning, I walked in the kitchen and I saw something out of the corner of my eye – Is that a really big bug? Oh. No. It’s not a plane. It’s not Superman. It’s a bird. I have a teensy tiny fear of birds. And this bird is fast – it's on the countertop, then the stove, then a baking sheet (note to self: wash baking sheet immediately). And I’m stumbling around and I’m trying to figure out how the bird got in and the dog’s looking at me with those big, brown eyes ("What’s all this noise?") and I'm looking back at the dog ("You're no help!"). I open all of the doors in the hope that the bird might fly on out. But it doesn't. It swoops fast and heads to the guest room. I know I'm in trouble. I close the door to the guest room and call animal control. I like to think I’m pretty good in a crisis. But I don't do wildlife. Animal control arrives 30 minutes later; I point them towards the guest room and stay out of the way. I hear cursing and loud thumps. Finally, the bird is escorted out in a net and released. And I spend the next 30 minutes with a roll of paper towels and Chlorox, wiping up bird poo. Fun morning. This morning was much, much better. What can I say? Some mornings, I get to chase a bird around my kitchen. Other days, I listen to jazz and make baked oatmeal. * See the next post Saturday Morning Baked Oatmeal for more photos and the recipe.